The shoe industry in 2020 – a look ahead: the Italian shoe industry accepts the invitation of Sympatex and PIDIGI S.p.A. The longstanding cooperation partners will present which global challenges the industry will have to face in the years to come by means of a joint presentation. 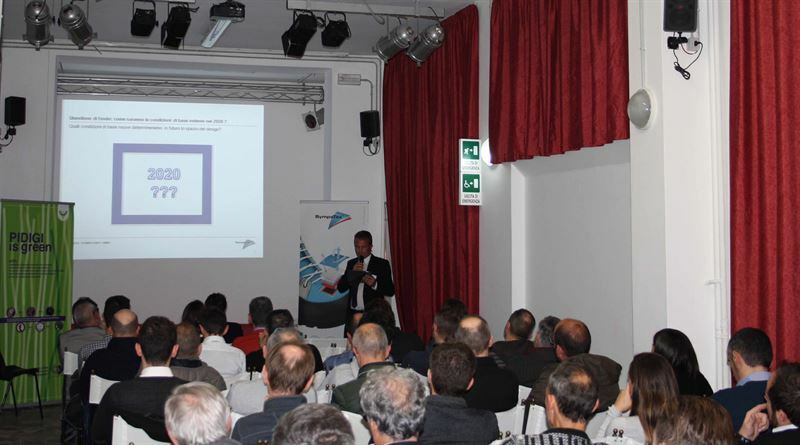 Munich / Montebelluna, 6 December 2017 Sympatex Technologies and PIDIGI S.p.A. were delighted about such a great response in Montebelluna in North Italy last Thursday evening. The functional specialist and its longstanding Italian sales partner had invited the gathered Italian sports shoe industry to the museo dello scarpone e della calzatura sportive (Ital. shoe museum). As part of this event, Dr. Rüdiger Fox, CEO of Sympatex Technologies, and Dr. Giorgio De Gara, owner and managing director of PIDIGI S.p.A., together revealed the global challenges and new technologies which will also force the shoe industry to reinvent itself. During his opening speech, Fox particularly mentioned the massively changed role of the topic of sustainability as perceived by the general public. Reports on plastics in water, scarcity of drinking water and waste have tremendously increased in the past. “I would like to emphasize that I don’t want to make any moral assessment. We as a company are also part of the industry and leave a footprint. However, we should become aware of the brewing thunderstorm which can and will force our industry – and others as well – to profound changes due the scope of the topic. The only question is when it will move in“, adds Fox. According to Fox a clear sign for a fundamental change was also that the shoe and textile industry hasn’t only been the focus of attention of ecologically ambitious NGOs, such as Greenpeace or WWF. This year‘s comprehensive report with the title “Pulse of the Fashion Industry“ published by Boston Consulting Group, one of the leading consultancies of the world, used a clear language: if the industry didn’t assume its ecological and social responsibility in a timely manner, this would lead to widespread economic disadvantages threating our existence in the next 10 years. “Pidigi will celebrate its 65 years of activity in 2018; the secret of such business longevity? Looking ahead and understand where the business and customers' needs are going to. Today our company wants to face a new important challenge: eco sustainability of our products, industrial processes and business model", explains De Gara. “We don’t only believe that we have to assume responsibility for the consequences of our actions, but we also believe that this will be the key for future success. One part of our agenda 2020 is the 100% climate-neutral, PFC-free and PTFE-free Sympatex membrane as well as the first integral laminate clustering by purely ecological aspects allowing the customer to make reasonable purchase decisions. We invite you to jointly bring the next framework conditions of the shoe industry to live“, adds Fox at the end of his speech. Year after year Pidigi has achieved such a level of specialization to match the most important European groups of the field and is able to supply the most complete, qualified and reliable range of materials, accessories and components available on the market today. With a logistic centre of 15.000 sq.mts and over 10.000 articles handled Pidigi can meet the requirements of various markets: footwear, leatherwear, sports-, technical and safety apparel. Pidigi’s products are certificated.